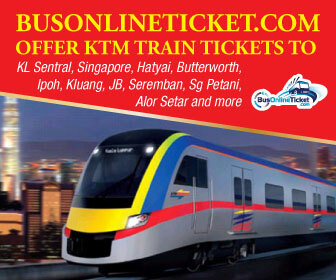 The cheapest way to Johor Bahru would be to take Bus No. 170 from either Queen Street Bus Station or the bus-stop along Rochor Canal Road (just after Sim Lim Square). The bus fare is S$1.60. The service runs from 5.20 a.m. to 12.10 a.m. everyday. 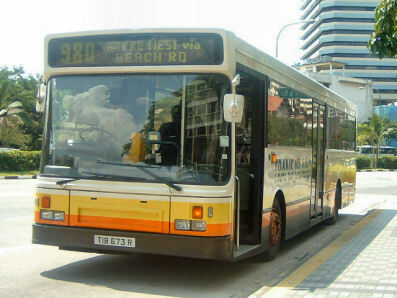 The bus will stop at the Singapore checkpoint. The bus will not wait for you whilst you clear immigration, so take all your belongings with you. Keep your bus ticket and hop on the next Bus No. 170 which comes along. You don't have to pay again. The bus will stop again at the Malaysian checkpoint, which is at the other end of the Causeway linking Singapore and Malaysia. You will have to get off to clear immigration. Once more, the bus will not stop for you to clear immigration, so keep your bus ticket if you intend to catch the next bus. After clearing immigration, you have the option of either walking straight into Johor Bahru or to hop on the next Bus No. 170. 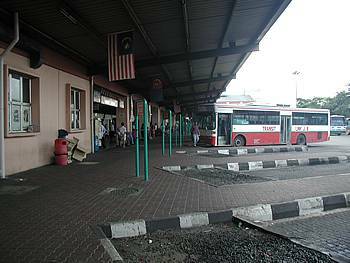 The bus will take you to the bus-stop outside Komtar Shopping Centre (along Jalan Tun Abdul Razak) first, before stopping at Larkin Bus Terminal (at Jalan Datin Halimah in the outskirts of Johor Bahru). 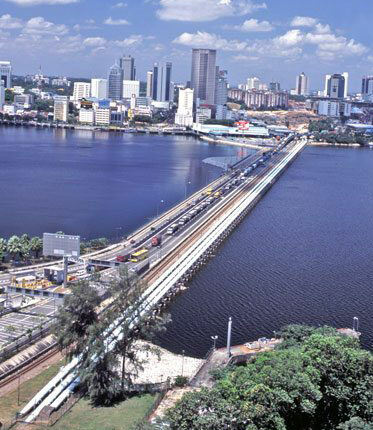 The old Johor Causeway (1924) is a 1,056-meter causeway that that links the city of Johor Bahru in Malaysia across the Straits of Johor to the town of Woodlands in Singapore. It serves as a road, rail, and pedestrian link, as well as piping water into Singapore. The causeway connects to the Skudai Highway on the Malaysian side and the Bukit Timah Expressway on the Singaporean side. It carries 60,000 vehicles on a typical day, with particularly bad traffic congestion on the eve of public holidays. Malaysian government has proposed replacing the old causeway with a new bridge. 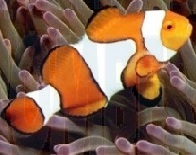 Singapore however has been reluctant to go ahead with the project. This has resulted a political rift between the two countries since the early 2000s. When travelling between Singapore and Malaysia, there is no more convenient way to go than the easily accessible Second Link. Broad expressways provide a fast, smooth crossing, while the various facilities offer all the convenience and comfort you require on your journey. Second Link is the obvious choice for both people and goods crossing between Singapore and Malaysia. Whether you call it the �Malaysia-Singapore Second Crossing�, just the �Second Crossing� or even �Linkedua�, the Second Link refers to the bridge that spans the stretch between Singapore and Malaysia. It extends a total of 44 km from Tanjong Kupang to Senai in Johor, Malaysia and a twin deck bridge supporting a dual three-lane carriageway linking Tanjung Kupang in Johor and Tuas In Singapore. The Second Link was first opened to traffic on 2 January 1998. It was officially opened on 18 April the same year by the then Prime Ministers of both countries, namely Dato' Seri Dr. Mahathir Mohamad of Malaysia and Mr Goh Chok Tong of Singapore. The Malaysia-Singapore Second Crossing heralded a new era in bilateral relations, and brought with it the promise of improved economic and social ties. Today the Malaysia-Singapore Second Crossing, also known as the Second Link, provides speedy clearance and a hassle-free journey to commuters. This alternative route to the now infamous Causeway is certainly much faster, easier and safer. The Second Link is already being regarded as the obvious choice for the transportation of people and goods between Malaysia and Singapore.